This month proved to be a fantastic month for the archive tape digging activities of Curious British Telly. 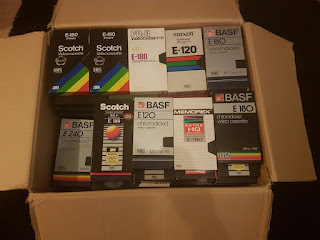 At the start of the month, I received an email from someone who had been enjoying the various features of the blog and just happened to have a collection of VHS tapes going back to the early 1980s. And would I be interested in them? Suffice to say, I was soon on my way to Manchester to delve through this exceptionally kind donation of around two to three hundred tapes. Thankfully, I'm not starting to associate certain case designs with their year of manufacture (cool, I know) and this helped me speed through them fairly quickly and pick up some remarkably old tapes. And, although many of the tapes contained endless episodes of Bilko and Laurel and Hardy films, there was also a whole treasure trove of material to sift through in terms of programmes, adverts, junctions and continuity - including some of the (probably never saved to the archives in the first place) in-vision continuity featuring regional announcers. A selection of the most interesting ones can be found below, but I still haven't finished going through all of them yet and this will probably spill into next month's update too. And, yes, there's a lot of Sue Robbie in there. A little snippet of particularly distressing and violent lunchtime news from Granada Reports hosted by Charles Foster. Not only do we hear about a vicar getting stabbed in his own church, there's also news on a Liverpool man who's died after falling on his electric fire AND a quick report on Hurricane Higgins court case for assaulting a snooker official. Perhaps the only nice thing in this clip is that there are Granada slides for Rainbow and The Raggy Dolls. Seeing as these tapes came from Manchester, it's no surprise that there was some football action on there. And, thankfully, it featured the red side of Manchester in the form of "United" as the locals say in an FA Cup game against Everton. In particular, it was an episode of Match Time which was an ITV show that used to feature highlights from games and all the latest news. Although this rather lengthy clip includes the opening titles and first few seconds of the match, the rest of the first half highlights are missing and action suddenly resumes with the second half highlights which are all present and correct. And it's a highly interesting clip not just because United beat Everton on their way to lifting the FA Cup later in the season, but also because of the huge juxtaposition with modern football that it demonstrates. Sure, huge sections of the crowd are standing and the rather ominous pens around the stands are unusual sights in 2017, but it's the post match coverage which is most striking. Ron Atkinson and Howard Kendall conduct a post match interview on the pitch and act like a pair of gentlemanly pals - imagine Mourinho and Wenger doing this today! In the early days of Children's ITV, there wasn't a specific presenter in place as there would be in later years. Instead, guest presenters came in for month long stints to announce the afternoon's programmes. And here, from May 1984, are three brief sections of continuity from Granada presenter Sue Robbie at the helm. A highly curious and unusual awards show, Noel Edmonds' Golden Egg Awards was a spinoff from a feature on The Late, Late Breakfast Show and is almost beyond description. However, if you can imagine, for a second, an awards show that rewards the stars of You've Been Framed and It'll Be Alright on the Night with golden eggs then you've cracked it. Despite this strange premise, it's oddly watchable and features appearances from the late Mike Smith and Murray Walker, so watching them is always a nice reminder of their talents. The promise of a New Year is always an exciting proposition and it's no different for the TV schedules. And this BBC preview of new drama shows is paticularly intriguing as it features a quick look at a new show called Lovejoy. Just imagine the wonder of watching this and thinking "You know what, I may well fall in love with this show...". In fact, maybe I did. I can't remember, though, as I was only three at the time. Unfortunately this isn't a full episode of the Derek Griffiths classic, but it's more than was previously available. And, yes, it's always great to hear Griffiths dusting down his vocal chords for some melodic goodness, but it's the See-Saw slide which precedes the show which is most amazing in my opinion. Not only does it kindly ask the viewer to wait for five minutes, but it's soundtracked by some remarkable BBC library music. For five minutes. FIVE! Some of the oldest adverts I've found, I believe these are from 1982 due to the Tron trailer although someone contacted me on YouTube who thinks Tron came out in the UK in January 83. Either way they're pretty old and all filmed on fantastic 35mm film complete with grime and filth all over the film due to their over-usage. So, perhaps the best month I've had so far in terms of digging up bits of British TV which haven't been seen in decades. Although this will probably be hard to top, I'm still on the lookout for VHS tapes from the 1980s, so get in touch if you've got any stacked up in cupboards collecting dust! And I'm also planning to get a Betamax player in the near future, so if you've got any Betamax tapes knocking about then please let me know! Ooh, if you come across any Granada Upfront on those tapes (a live late night discussion show with Tony Wilson and Lucy Meacock) do let me know! I'd love to see some of those again! Not seen any yet - no Wilson actually which is a surprise - but will keep my peepers peeled! You had me at Sue Robbie! Also, most of those ads were originated on 35mm and a lot were telecined first in order to add straps, lower thirds etc for playout on a video cartridge system. Great trip down memory lane! Ah, 35mm! Of course, not enough grain for 16mm! Thanks, now edited! And more Sue Robbie to come next month! Great to see these - thanks for sharing. I was a Tech Op at Thames in the early 90s and when I first started we were transmitting commercials from 2" Quad cartridges using the awesome (and at times terrifying) Ampex ACR25. Breaks were made up on the ACR and dumped to a Panasonic MII cassette tape for TX one or two in advance. By then all commercials either came in on 1"C g-spools (small, plastic open reels) or were recorded from the network playout from the various post production houses and mastered onto the aforementioned 2" carts. Late in 1990 or early '91 we swapped over to a more modern automated cart system using the in-house MII format but that wasn't anywhere near as much fun..
My ultimate find would be reports of the Northampton Balloon Festival (especially its glory years between 1990 and 2000). The single most anticipated event of my childhood and the epicentre of my personal nostalgia. You'd have to find someone from the East Midlands or Anglia regions for that though. Actually, if you could find any evidence of it, an entry on Northants TV (on air from 1997-2002 I think) would possibly be the very definition of Curious British Telly. I wonder if any other counties had their own channels. Northants TV? Never heard of that, so it's certainly worthy of an investigation! You're not likely to have heard of it unless you're from round here. Aside from the Balloon Festival coverage I mainly devoured the sport which was pretty much non-league football - when Rushden & Diamonds were beginning their rapid rise and fall, and Kettering Town were also a force in the Conference - and stock car racing. Obviously they weren't allowed to show Cobblers games, though they did run a few features, most notably when we got to Wembley and nearly reached the Championship in 1998 (I still hate Grimsby, what a stupid name!). In fact, NTV's existence coincided with the halcyon days for Northants footie. Yes, two clubs in the League counts as 'halcyon' for us. Everything's relative, y'know.